The Navy only has one location for enlisted basic training: the Great Lakes Naval Training Center in Illinois. All new recruits will spend boot camp here, but don't worry about doing drills in inclement weather; unlike the other branches of the U.S. military, most of Navy boot camp is conducted indoors. This means there are indoor marching and drill, the confidence course is indoors and even weapons like shotguns and pistols are fired indoors. This makes a lot of sense if you think about it: much of Navy life and duty is spent aboard a ship or in a submarine. The Recruit Training Command processes more than 50,000 recruits through Navy boot camp per year. But before you can take part in Navy basic training, you must pass an initial fitness assessment. Your recruiter administers this test. The initial standards are listed below. During the first week of basic training, you will also have to pass a Navy 3rd Class Swim Test. If you can't swim, don't worry. The Navy instructors will teach you how (at least well enough to pass this test). Obviously, this is going to be a crucial skill to have in a branch of the service where you're likely to see a fair amount of time at sea. 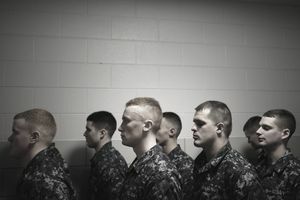 In order to graduate from Navy basic training, you must score at least a "Good (Low)" score on the normal Navy Physical Readiness Test (PRT). For men age 17 through 19, that means 62 sit-ups, 51 push-ups and running 1.5 miles in 11 minutes. For women in this age bracket, they'll need to do 62 sit-ups, 24 push-ups and 1.5 miles in 13 minutes, 30 seconds. The Navy does not usually grant leave (time off or vacation) immediately after basic training. When you graduate from Navy basic, you'll proceed to your Navy A-School (job school). Your first leave will be when you graduate from A-School or around 10 days during the Christmas period, whichever happens first. If you enlisted under the GENDET or GTEP programs (no guaranteed job), your first leave will be at the discretion of your supervisor.